Joar Leifseth Ulsom may not be flashy or brash, but he has sled cred. The quiet, unassuming 32-year-old defending champion of the Iditarod Trail Sled Dog Race leads the field of 52 mushers hoping to be the first to reach Alaska's western coast after a thousand-mile (1,600-kilometer) trek across the wilderness. Most of the contestants are Americans, but the lineup also features international mushers: two from Norway, including Ulsom; four from Canada; and one each from Sweden and France. Their quest officially began Sunday when the mushers took off from a frozen lake about 50 miles (80 kilometers) north of Anchorage. A ceremonial start designed to be a fan-friendly experience was held Saturday in downtown Anchorage. The winner is expected in Nome, an old Gold Rush town on Alaska's Bering Sea coast, in about nine days. The Iditarod seems to go in streaks. Lance Mackey in 2007 won his first of four straight before health problems began to set in. Two years after Mackey's run, the Seavey legacy took hold, with mushers Mitch and his son, Dallas, combining to win the next six races. Ulsom broke the Seaveys' string last year. If that came as a shock to anyone, they weren't paying attention to his career. His worst Iditarod finish was seventh place in 2013, his rookie year. Since then, he's had two sixth place finishes and a couple of fourths. It's all part of his strategy. "Basically since I came to Alaska, I kind of had a good plan," he said. He tweaks it little by little every year, but he hasn't made any wholesale changes to his training now that he's the defending champion. What has changed for the musher living in Willow, Alaska's dog-mushing capital, was the instant fame his victor status granted him, not only in Alaska but in his Norway. "It's definitely been a bigger deal winning the race than I thought it was going to be," he said. Ulsom traveled to Norway twice last summer for dog symposiums where his victory was celebrated alongside those of other winter athletes. Norway won the most medals at last year's Winter Olympics in Pyeongchang, South Korea. There is "definitely a lot of pride in Norway from the Olympics and for me winning the race because mushing, I think, is second to Alaska in popularity," he said. "It's a big deal in Norway, and they have some good races over there." But he promises it hasn't changed him or gone to his head. "It was a lot of fun, and people are excited and stuff, but nothing crazy," he said. "I'm still just a normal goofball." One of Norway's big sled dog races is the Finnmarkslopet, which starts about a week after the Iditarod. Ulsom said it draws mushers from across Europe, but for the second year in a row, it has one of the top American mushers. Four-time Iditarod champion Dallas Seavey took his team to Norway last year in protest after Iditarod officials said some of his dogs tested positive in 2017 for an opioid painkiller, an allegation he adamantly denied. New members were later placed on the Iditarod's governing board, and they reversed the decision, clearing Seavey of any wrongdoing. Yet Seavey chose to race again this year in Norway, telling The Associated Press he had unfinished business there after placing third last year. He said he would eventually return to the Alaska race. The Iditarod has suffered other recent setbacks, many related to the animal rights organization People for the Ethical Treatment of Animals pressuring national sponsors to drop the race. When national sponsors drop out, smaller Alaska-based companies fill the void, but the race has been hurt financially. 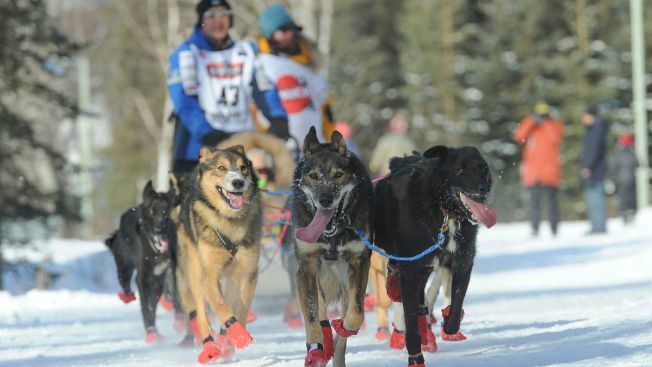 The winning musher will earn about $50,000 and a new pickup, the same as last year. But it's down about $20,000 from the winner's purse in 2017. The total purse this year is again $500,000 — about $250,000 below the 2017 purse. Ulsom calls the PETA activism "kind of ridiculous when you start looking into it," adding that mushers take "exceptional" care of the dogs and use them for what they're meant to be used for. "These dogs have it in them that they want to run, and so that's what they're bred and meant do, and they love it," he said.